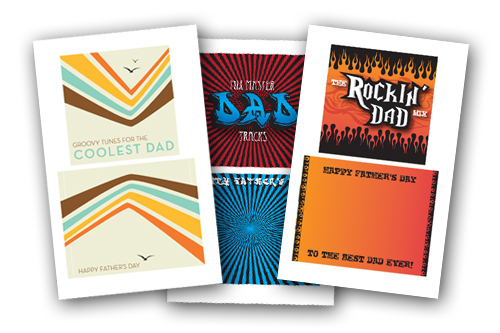 So you’re running out of ideas for what to get Dad for Father’s Day. What do you do? 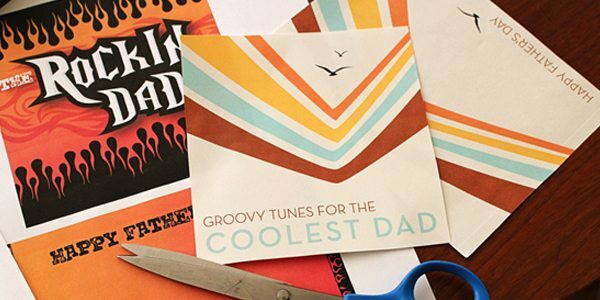 Ties are boring, golf equipment is expensive, you don’t have enough time to organize that deep sea fishing trip he always wanted… how about something old school like a mix CD of all his favorite songs? Perfect, right? You can even take it one step further and record a personal message at the beginning of the CD that he will treasure until the end of time. Nowadays with iTunes and garage band or whatever music software you use on your personal computer, making your own .wav files is pretty simple! Don’t worry, I’ll break it down for you. 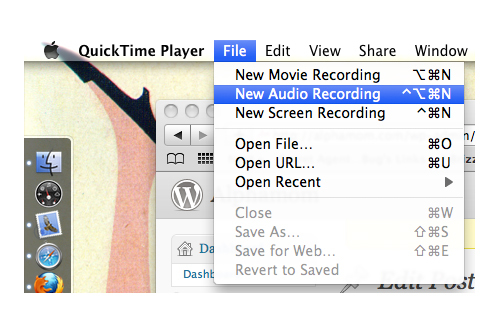 Open Quicktime and under the “File” menu you’ll want to select “New Audio Recording.” A window will pop open and with a click you’ll be able to record your voice. 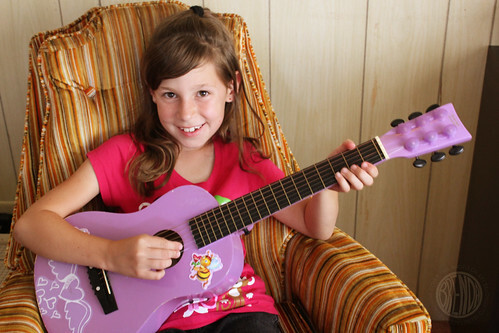 My daughter, who’s a bit of a ham when it comes to singing, recorded her own little song that nearly broke my heart. I can’t wait to see what her dad thinks of it. When you’re done recording, just hit “stop” and then save it. 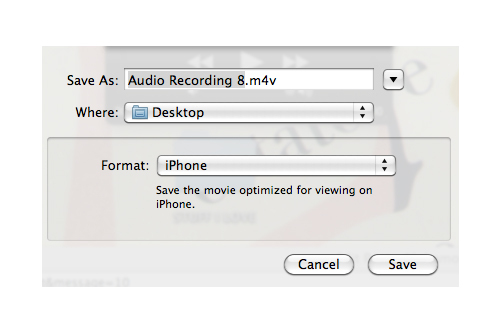 You want save it as an “.m4v” file. You can get this format by selecting the iPhone menu option. Save it to your desktop or somewhere you can find it again easily. Next you’ll want to open iTunes or whatever music burning program you use and simply drag and drop your audio file into your playlist with the songs you want to burn onto your mix CD. You could record a whole podcast this way. But we stuck to a short and sweet Father’s Day message and a song. Now you’re ready to burn. Burn, baby, burn! You’ll want to purchase some “CD-R” CDs from your local office supply store. Make sure you don’t get the re-writable kind because those ones won’t play in your car stereo. I know everyone has an mp3 player these days but we’re going old school for presentation sake. 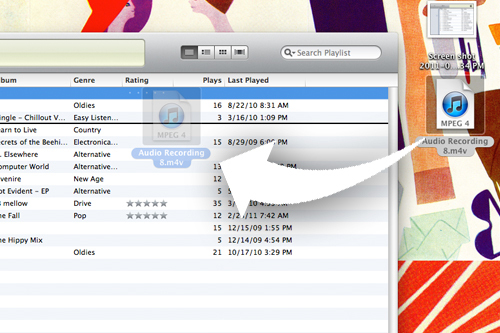 Insert your blank CD when prompted and burn! Next up is making the CD cover packaging–the best part if you’re a graphic artist like me. But don’t worry if you’re not. I’ve made some templates for you that will make this part super simple. 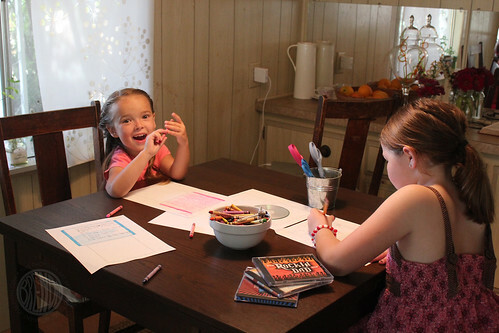 Or maybe your special dad needs one that is especially designed by you, with crayons! 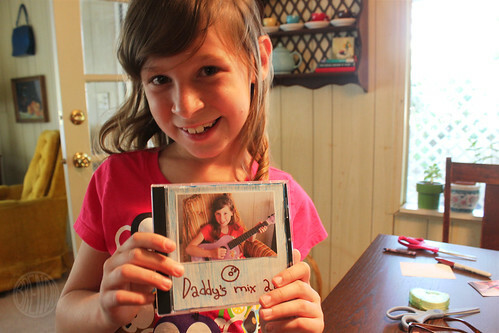 There is even a generic cd template that you can print out and your kids can color! Now this is the tricky part but you can do it. (Or maybe you’re a total expert at this because you used to make custom cd’s for all your friends in college back in 1993 or something? No? Nevermind then.) 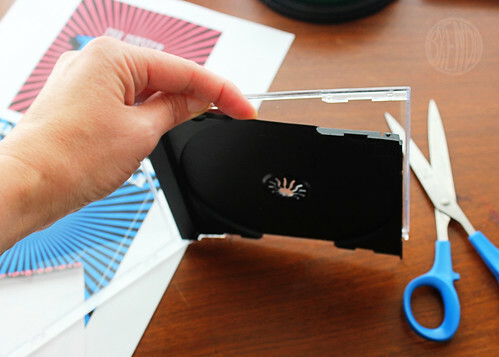 After you’ve cut out your cd covers, gently pop apart the back of the jewel case and insert the bigger square with the sides folded. Then push the black plastic tray back in. Insert the front sleeve and you’re good! Like so! 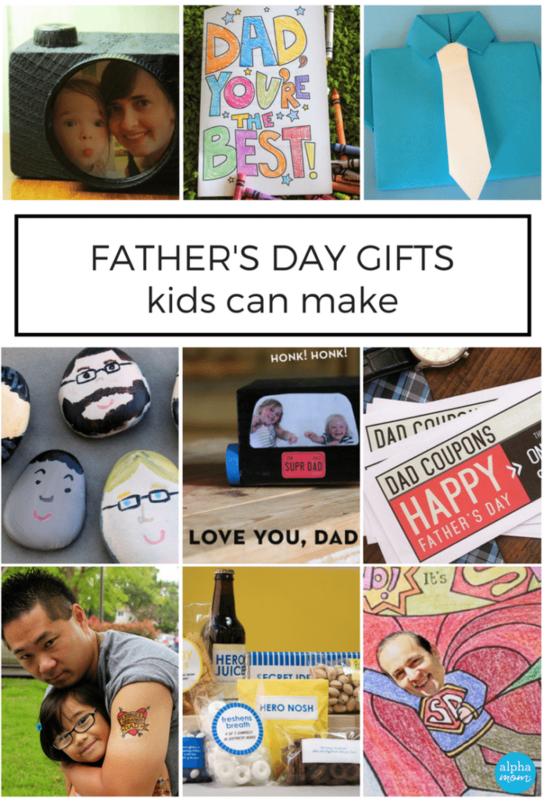 Stick a bow on it and it’s the most thoughtful Father’s Day gift ever! 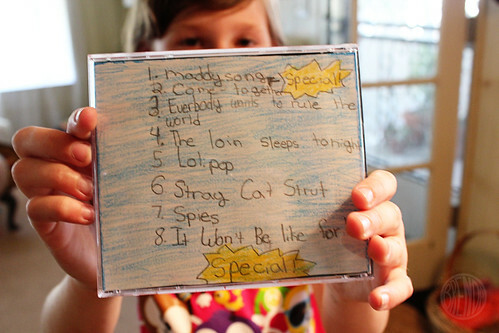 Since my husband’s ipod was recently stolen, I think I’ll let the kids make CD’s for him to listen to in the car. Hee, hee… The Loin Sleeps Tonight! Fantastic post!!! I’m absolutely using this for my music-geek husband. I never thought about putting a message from my girls on it. He will love it. Thanks for such a great idea! Thank you so much for this post! 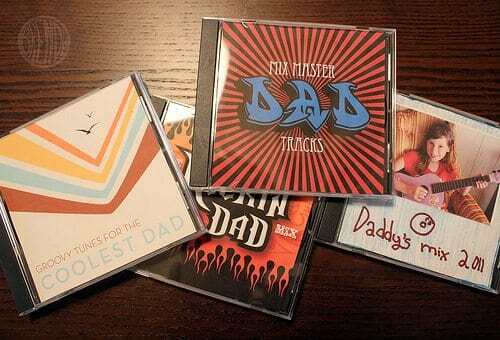 I am newly married and BROKE so this was the perfect idea for someone like me whose living on a tight budget, has two dads now and loves to make mix CDs! Thank you for taking the time to share your ideas!